Everyday life is full of little challenges and tasks which the healthiest and able-bodied people find difficult or tiring. These tasks include Hoovering, cooking, hanging the washing out and many other tasks in day to day life. All of these tasks are important in day to day life but can be tiring and difficult to fit into a busy lifestyle. These tasks become even harder when suffering from impairments or diseases such as Arthritis, which affect your grip and motor functions. Suddenly these tasks are near impossible without strain on muscles and joints, usually accompanied by lots of pain. This can pose a threat to your independent living and general lifestyle. Luckily, Tenura has a wide range of products which can be combined to help in all areas of the home. In this blog post, we will be focusing on how different diseases and motor impairing injuries can affect a very important part of daily life. How to make mealtimes easier! Whether it's breakfast, lunch, or dinner, mealtimes can be stressful and exhausting, especially with a young family. There can be spills, stains, arguments and tears. This is something we can all do without, especially when hot liquids or food can ruin clothes, burn skin or make a big mess which someone (usually you) will have to clean up. Tenura can provide high quality daily living aids designed to prevent spills and stains, make cutlery easier to hold, and keep plates and dishes steady. 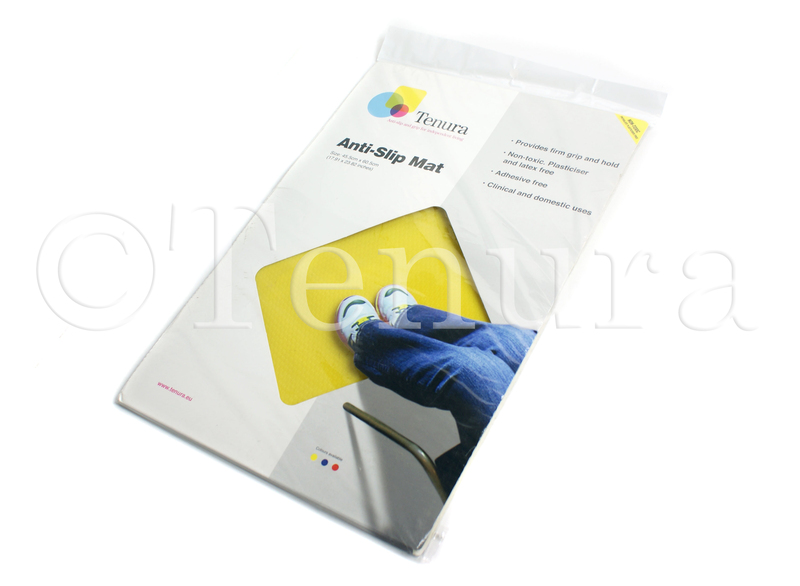 Tenura anti slip rectangular mats are ideal for placing on trays, tables and at the bottom of chairs or stools. Tenura rectangular anti slip mats create a strong non slip grip with any flat surface they are placed upon, and any object placed on its surface. This will help to keep plates, dishes, and bowls at the dinner table from sliding, helping to prevent potential spills and stains. These mats are constructed from an anti-microbial silicone, meaning no bacteria or germs can harbour or grow on this material. Tenura mats are also very easy to clean, a simple application of soap and warm water will be more than enough to clean off any dirt or grime that may build up after a prolonged usage. After this material has dried, it will regain all non-slip properties, allowing it to be used again and again. Tenura anti slip rectangular mats can also be found in a larger floor mat design. This mat has a textured non slip surface, designed to have shoes or boots resting on it. This mat can be placed at the bottom of beds, chairs, and even toilets. This will help to stop your feet from slipping, which could lead to a serious injury, especially for those who have trouble walking freely. This mat is also really useful for wheelchair users. This mat can be carried with you on the go with ease, then placed down in front of you on a flat surface. This mat will provide a strong surface for you to stand and sit, without the chance of your feet slipping and sliding from underneath you. Tenura anti slip mats can be found in many different sizes and in different colours to suit your needs. In day to day life, we all have clumsy moments which can lead to spills and stains which you have to clean up. We have all knocked a fresh cup of tea or coffee all over the floor. Tenura coasters are there to safeguard against this problem by creating a surface in-between the cup and table and stop the cup from moving. Unfortunately if you have a coaster on a particularly shiny and slippery table, this can move around and slide, potentially spilling the cup, mug or glasses contents all over your table, work surface or breakfast bar. This can not only create one big mess, but could lead to slips and falls which could lead to serious injury. 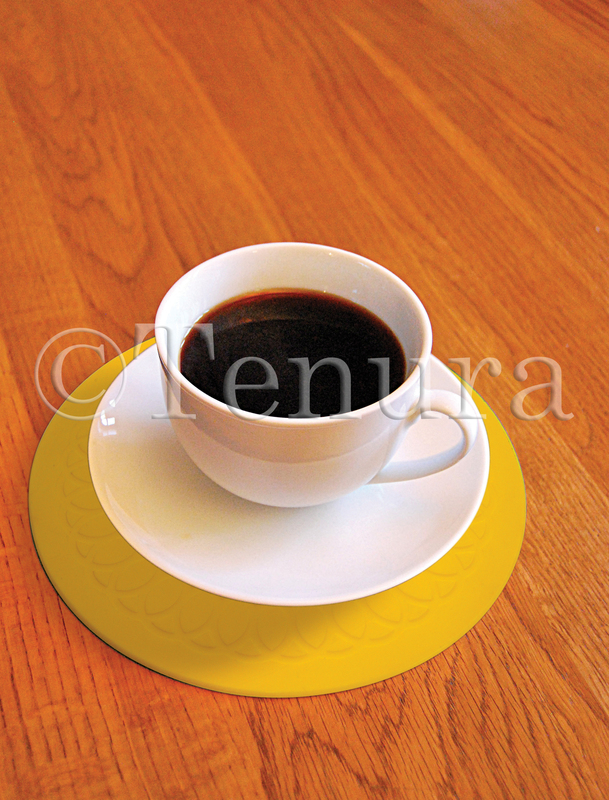 Thankfully Tenura has a wide range of silicone anti slip coasters, in many different sizes and shapes, designed to prevent objects from sliding around and accommodate all size of cups and mugs. Tenura square coasters are made from a silicone rubber, meaning they have excellent grip qualities. This will help to prevent objects from moving on the table and cups and mugs from potentially spilling over by creating a strong non slip surface with the table it is placed on and the cup which rests on its surface. This product comes in a pack of four and is ideal for use all around the home and even in the workplace. Tenura can also offer Anti-microbial cup holders. This product is designed to be attached to the bottom of cups and mugs, allowing you to create a portable non slip surface. This allows the cup or mug to be moved anywhere around the house without needing a coaster or cover to prevent damage or spillage on surfaces. Tenura cup holders can be applied and removed from cups with ease without leaving a residue. This product can be washed and used again and again once dry. Tenura coasters are a great help in day to day life by providing a strong non-slip surface to rest all manner of containers and cups/mugs on, preventing them from slipping and sliding which could cause spills and stains. Tenura anti slip circular coasters are one such product. Tenura circular coasters create a strong non-slip grip over a large area of any flat surface. This coaster can be found in two sizes, 14cm & 19cm, making it perfect for cups and mugs or bigger items like bowls, plates, food containers and many other items. This materials non-slip grip will help to stop spills and stains which could occur due to unwanted movement from the container. By creating a strong non-slip surface, this massively decreases the chance of spills, making day to day life easier and eating/drinking safer. Like all of our coasters, Tenura circular coasters will not harbor bacteria or grime. This is thanks to its Anti-microbial construction. 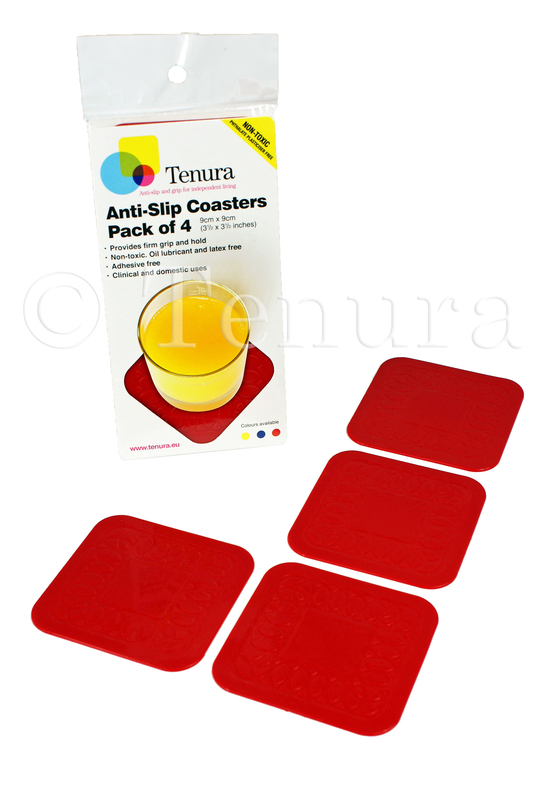 Tenura coasters can also be washed with ease and will regain all non slip properties again once dry. Arthritis, hand impairments and diseases which affect motor function can make meal times a hassle, especially when it comes to handling utensils such as knives, forks, and spoons. With arthritis affecting a persons ability to grip items effectively, as well as causing discomfort and pain, this makes the idea of meal times a daunting experience. 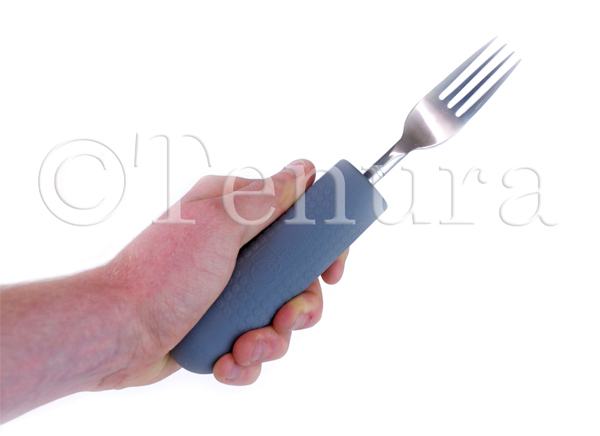 Tenura cutlery grips are designed to make this sort of task and many others a lot easier. Tenura cutlery grips are a large non slip handle, designed to allow knives, forks, and spoons to be slipped in with ease, instantly increasing the size and enhancing the surface area for the user to grip and make the cutlery easier to hold. This can make meal times a much more pleasant experience, and help to reduce pain and discomfort for those who suffer from hand and grip impairments. Cutlery grips can be easily washed and are anti-microbial, meaning no bacteria or dirt will harbour on its surface. Tenura cutlery grips come in a pack of 2, allowing you to create an enhanced grip on knives, forks or spoons at the same time, without the need for constant switching of utensils. Tenura Cupcaps create a seal over cups, mugs and cans, preventing spills and stains, and keep drinks fresher for longer. This anti-microbial silicone material can be stretched over the top of cups and mugs with ease, leaving a straw hole in the middle to allow liquid out of the container. Cupcaps are perfect for hot and cold liquids, and can be washed with ease. This product is ideal for those who suffer from grip impairments or diseases like Parkinson's, were uncontrollable shaking or movement may cause spills. By creating a seal over the top of the material, this virtually eradicates spills, and to drink, simply place a straw into the middle valve inside the Cupcap. This allows you a lot more freedom as to where you can go with a beverage and when you can drink it. A good example of this would be when in a moving car or getting from one part of the house to the other! 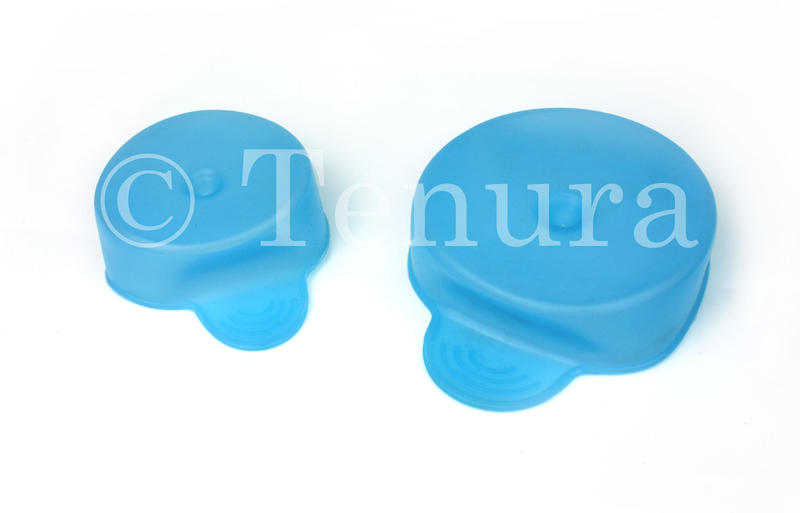 Tenura Cupcaps come in a pack of two one larger 80mm Cupcap and a smaller 60mm one. This allows you to cover and protect yourself and your surroundings from multiple drinks spilling. This could potentially cause damage, nasty stains or a slippery mess which could lead to a fall. Tenura Cupcaps have strong non slip qualities when dry, and can be used multiple times over on cups, mugs and cans. By combining Tenura’s wide range of daily living aids, you can re-claim dinner times and make all the tasks involved from preparation to simply taking a drink much easier. 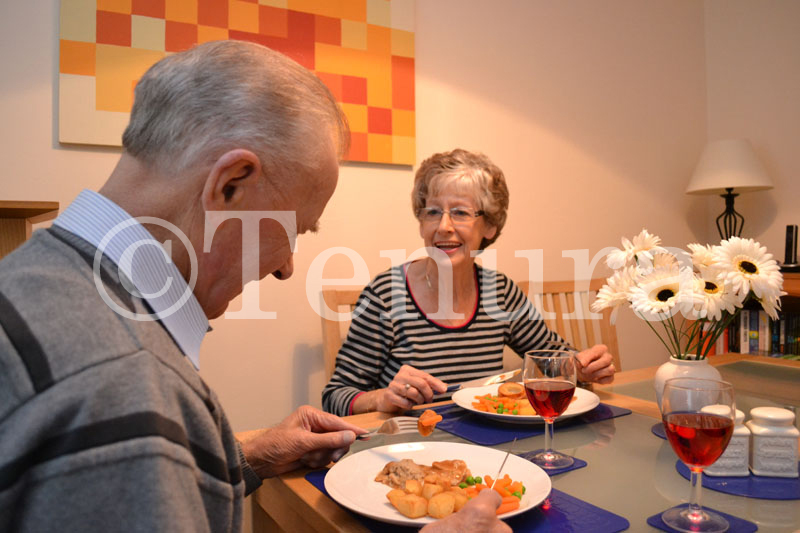 Tenura’s wide range of daily living aids will help to make mealtimes easier, making them a pleasure rather than a chore. For more information on the wide range of products Tenura offers, or the many uses our products have, please contact us via the contact us page or visit the Tenura product page to view the complete range. Posted in Arthritis Aids, Assisted Living, Daily Living Aids, Independent Living, Tenura Updates and tagged tenura, daily living aids, independent living, how to make mealtimes easier, make mealtimes easier, anti slip mats, anti slip coasters, cup holders, cutlery grips, cupcaps on 26th April 2016 .